Fungi have been present for around 1500 million years with more than 1.5 million species out of which only about 300 species are known to cause human infections., Fungi were recognized earlier than bacteria as a pathogenic agent of human disease with David Gruby describing etiological agent of favus, ectothrix, and endothrix into three genera, Epidermophyton, Microsporum, and Trichophyton. Despite their early discovery, most widespread infectious diseases in the 19th century were attributed to bacterial, parasitic, and to viral origins. From the mid-20th century, the incidence of severe systemic fungal infections increased significantly, mainly due to increase in the number of patients with compromised immune system such as acquired immunodeficiency syndrome (AIDS) or postorgan transplantation and chemotherapy. The indiscriminate use of antibiotics added to the worsening of this picture, leading to the installation of fungal infections. Among all fungal infections, superficial mycoses are the most frequent forms of human infections, affecting more than 20%–25% of the world's population. It is also estimated that 30%–70% of adults are asymptomatic carriers of these pathogens. In addition, species of dermatophytes are divided into zoophilic, geophilic, or anthropophilic, depending on their primary habitat (animals, soil, or humans, respectively). Zoophilic species are responsible for about 30% of human dermatophytoses and usually cause acute inflammatory features. Anthropophilic species represent about 70% of infections on these hosts, causing a chronic infection of slow progression, suggesting that the fungus has adapted to the human host. The successful initiation of infection is a process closely related to the capability of the infecting dermatophyte to overcome the host resistance mechanisms. The immunological mechanism is cell-mediated, also more effective and protective, and is mediated by macrophages as effector cells and cytokines secretion from type 1 T-helper lymphocytes. The common antifungal agents and their mechanisms of action depending on the above are given in [Figure 1]. Azole resistance in dermatophytes has been reported to be as high as 19% in certain regions of the world. Occurrence of antifungal resistance has to be considered independently for each antifungal class and for each fungal genus. Secondary resistance develops among previously susceptible strains after exposure to the antifungal agent and is usually dependent on altered gene expression, for example, terbinafine resistance in T. rubrum, fluconazole resistance among C. albicans. Clinical resistance is defined as the failure to eradicate a fungal infection despite the administration of an antifungal agent with in vitro activity against the organism. Although clinical resistance cannot always be predicted, it highlights the importance of individualizing treatment strategies on the basis of the clinical situation. Fungal factors, host factors, and drug pharmacology play a role in fungal resistance in isolation or in association with other. The fungal molecular mechanism can result from gene amplification, gene transfer, gene deletion, point mutations, loss of cis- and trans-acting regulatory elements, and transcriptional activation. All these effects could be on genes directly involved in the combat against the cytotoxic compounds and/or could be on genes involved in their regulation or processing. 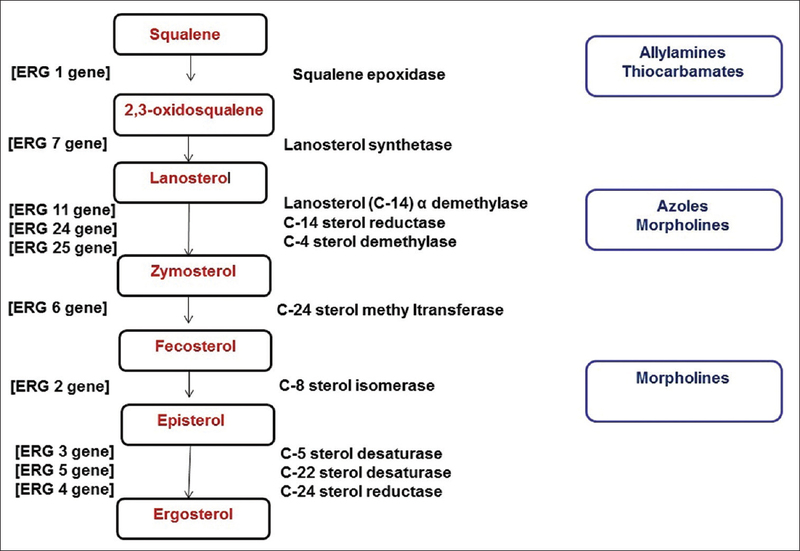 The genes responsible for ergosterol synthesis is given in [Figure 2]. Reducing the accumulation of the drug within the fungal cell is done by increasing the drug efflux mechanism. Multidrug efflux transporters are membrane proteins found in all living organisms. These proteins bind to a variety of structurally and chemically dissimilar compounds and actively extrude them from the cells. Mutations (upregulation or overexpression) of the genes encoding these efflux pumps result in decreased accumulation of the drug in the cell. Efflux systems affecting the antifungal drugs vary. Common drug efflux systems that modulate azole resistance are the ATP-binding cassette (ABC) superfamily and the major facilitator superfamily. Overexpression of TruMDR1 and TruMDR2 genes in T. rubrum, which encoded an ABC transporter was seen following azole and terbinafine therapy. A mutation or overexpression of the gene coding for target enzymes is another mechanism developed by fungi. A point mutation in the ERG11 gene that codes for lanosterol 14α-demethylase leads to the complete inhibition of the binding capacity of the azole drug to its target. Mutation in the squalene epoxide (SE) gene (ERG1) leads to an amino acid substitution in the SE making the fungi about 1000-fold less susceptible to terbinafine. The overexpression of target enzymes is either by gene amplification or upregulation of the corresponding gene. In chromosomal anomalies like isochromosome formation, an increase in the number of azole-resistant genes can occur. The antifungal drug 5FC competes with the regular pyrimidine intermediate metabolites for incorporation into nucleic acids.,De Novo increase in pyrimidine synthesis leads to 5FC resistance as seen in Candida glabrata. A decrease or total absence of ergosterol in the plasma membrane through mutations in nonessential genes of the ergosterol is a rare mechanism of resistance among polyene drugs, for example, ERG3 mutation in clinical isolates of C. albicans, ERG6 mutation in C. glabrata. Biofilms are sessile microbial communities surrounded by extracellular polymeric substances with increased resistance to antimicrobial agents and host defenses. Both T. rubrum and T. mentagrophytes are capable of producing biofilms. Fungi are remarkably adaptive and have numerous signal-transduction pathways to sense and ensure appropriate physiological mechanisms to adapt to environmental stress following exposure to an antifungal agent., Hsp90, Hsp104, ubiquitin, calcineurin, esterases, and oxidative-stress proteins such as glutathione synthatase are key cellular regulators critical for orchestrating cellular responses to drug-induced stress, e.g., in T. rubrum following azoles, griseofulvin and amphotericin B. Stress adaptation may not induce clinical resistance but stabilizes the cell in the presence of drug and allows it to develop more profound resistance mechanisms over time that are manifested as clinical resistance. Compliance in patients requiring long-term therapies. 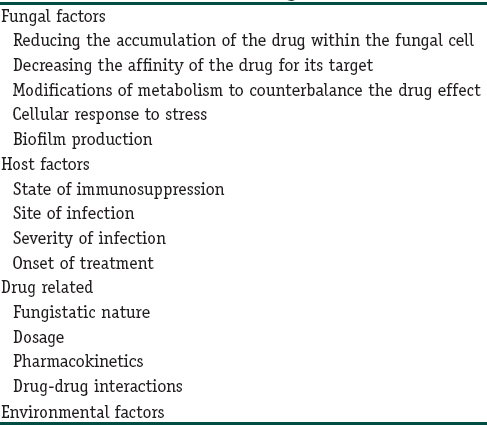 Various factors such as the fungistatic nature of most drugs, inappropriate antifungal usage (in cases where the etiological agent is known), treatment with low antifungal dosage, long duration of treatment, drug interactions, and the cost of therapy play a role in fungal resistance. Combination of polyenes and azoles with other nephrotoxic drugs can result in treatment failure. AFST patterns in dermatophytes show individual and regional variation in their outcome. Studies on AFST showed that T. rubrum and T. mentagrophytes, which were the common species isolated, showed a higher MIC to fluconazole. Although generally itraconazole, terbinafine had lower MICs, few studies demonstrated a higher MIC to itraconazole and terbinafine. Systemic griseofulvin and topical amorolfine had lower MIC than fluconazole. A study done by Koga et al. showed the lowest MIC to be with luliconazole.,,,, Rex and Pfaller proposed the “90–60 Rule” which states that infections caused by isolates that have MICs considered susceptible respond favorably to appropriate therapy approximately 90% of the time, whereas infections caused by isolates with MICs considered resistant respond favorably approximately 60% of the time. Clinically, antifungal resistance may be suspected in patients with recurrent episodes of infection, unresponsiveness to the first line of therapy, generalized involvement, or atypical form of presentation with usual history of similar lesions in the family. One of the important treatment measures in recurrent cutaneous fungal infections is prevention of disease among family members. Therefore, nonpharmacological measures like good hygiene play an important adjunct along with medications. The disadvantages are increased toxicity, increased drug interactions, increased cost, and poorly standardized methods of testing efficacy of the combination. Itraconazole and voriconazole are potent inhibitors of cytochrome P450 3A4 and associated with a greater risk of broader range of potentially severe drug interactions and hepatotoxicity than fluconazole. At present, checkerboard dilution assay is the most common laboratory method for evaluating antifungal combinations. Combination of antifungal drugs with nonantimicrobial agents such as calcineurin inhibitors (cyclosporine A and tacrolimus), proton-pump inhibitors, antiarrhythmic agents, cholesterol-lowering agents, immunomodulators, antineoplastic drugs, antiparasitic agents, microbial metabolites, and human recombinant antibodies has shown beneficial effects., Cyclosporine singularly is not able to inhibit the fungal growth but increases susceptibility to fluconazole due to efflux pump deletion or alteration of stress response caused by calcineurin during azole therapy. Studies show that statins are active against Microsporum canis and T. mentagrophytes. Synergistic interactions were noticed when simvastatin was combined with terbinafine against dermatophytes. Fractional carbon-dioxide laser therapy combined with topical antifungals such as terbinafine, amolorfine, or luliconazole was found to be effective in the treatment of onychomycosis. While deeper mycoses are still difficult to treat, common fungal infections in dermatology were considered easily treatable. Lately, fungi causing superficial mycoses also have evolved to develop resistance against commonly used drugs. Current solutions to this could be good skin hygiene measures, prudent use of antifungals in proper dosing and duration, appropriate use of susceptibility testing, usage of older molecules such as griseofulvin or topical keratolytics in combination with newer drugs and in appropriate dosages and combination therapy with two systemic antifungals or systemic antifungal with topical antifungals and/or topical keratolytics. The key to managing the widespread nature of this emerging problem would involve development of drugs with newer targets, decreased drug interactions, at affordable price, which at this stage appears distant in our scenario, knowing the resources required and the economics involved. However, newer insight on drug resistance mechanisms could lead to advanced treatment strategies in managing fungal infections. Srinivasan A, Lopez-Ribot JL, Ramasubramanian AK. Overcoming antifungal resistance. Drug Discov Today Technol 2014;11:65-71. Hawksworth DL. The magnitude of fungal diversity: The 1.5 million species estimate revisited. Mycol Res 2001;105:1422-32. Weitzman I, Summerbell RC. The dermatophytes. Clin Microbiol Rev 1995;8:240-59. Kapil A, editor. Ananthanarayan & Paniker's Textbook of Microbiology. 9th ed. Hyderabad: University Press Private Limited; 2013. p. 589-615. Martinez-Rossi NM, Peres NT, Rossi A. Antifungal resistance mechanisms in dermatophytes. Mycopathologia 2008;166:369-83. Nigam PK. Antifungal drugs and resistance: Current concepts. Our Dermatol Online 2015;6:212-21. Peres NT, Maranhão FC, Rossi A, Martinez-Rossi NM. Dermatophytes: Host-pathogen interaction and antifungal resistance. An Bras Dermatol 2010;85:657-67. Coelho LM, Aquino-Ferreira R, Maffei CM, Martinez-Rossi NM. In vitro antifungal drug susceptibilities of dermatophytes microconidia and arthroconidia. J Antimicrob Chemother 2008;62:758-61. Tainwala R, Sharma Y. Pathogenesis of dermatophytoses. Indian J Dermatol 2011;56:259-61. Léchenne B, Reichard U, Zaugg C, Fratti M, Kunert J, Boulat O, et al. Sulphite efflux pumps in Aspergillus fumigatus and dermatophytes. Microbiology 2007;153:905-13. Sanglard D, Odds FC. Resistance of Candida species to antifungal agents: Molecular mechanisms and clinical consequences. Lancet Infect Dis 2002;2:73-85. White TC, Marr KA, Bowden RA. 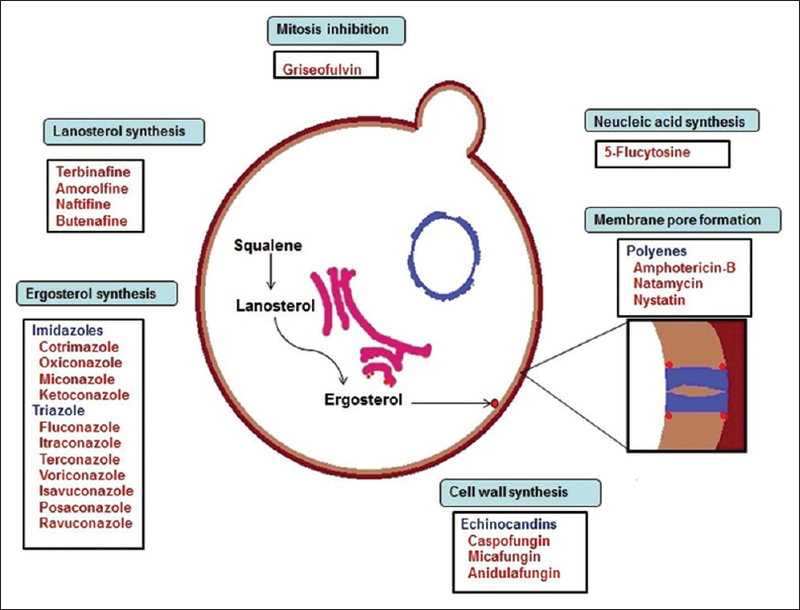 Clinical, cellular, and molecular factors that contribute to antifungal drug resistance. Clin Microbiol Rev 1998;11:382-402. Vandeputte P, Ferrari S, Coste AT. Antifungal resistance and new strategies to control fungal infections. Int J Microbiol 2012;2012:713687. Michaelides P, Rosenthal SA, Sulzberger MB, Witten VH. Trichophyton tonsurans infection resistant to griseofulvin. A case demonstrating clinical and in vitro resistance. Arch Dermatol 1961;83:988-90. Ryley JF, Wilson RG, Barrett-Bee KJ. Azole resistance in Candida albicans. Sabouraudia 1984;22:53-63. Mukherjee PK, Leidich SD, Isham N, Leitner I, Ryder NS, Ghannoum MA, et al. Clinical Trichophyton rubrum strain exhibiting primary resistance to terbinafine. Antimicrob Agents Chemother 2003;47:82-6. Law D, Moore CB, Wardle HM, Ganguli LA, Keaney MG, Denning DW. High prevalence of antifungal resistance in Candida spp. from patients with AIDS. J Antimicrob Chemother 1994;34:659-68. Ghannoum M. Azole resistance in dermatophytes: Prevalence and mechanism of action. J Am Podiatr Med Assoc 2016;106:79-86. Kanafani ZA, Perfect JR. Antimicrobial resistance: Resistance to antifungal agents: Mechanisms and clinical impact. Clin Infect Dis 2008;46:120-8. Perlin DS, Shor E, Zhao Y. Update on antifungal drug resistance. Curr Clin Microbiol Rep 2015;2:84-95. Polak A, Scholer HJ. Mode of action of 5-fluorocytosine and mechanisms of resistance. Chemotherapy 1975;21:113-30. Costa-Orlandi CB, Sardi JC, Santos CT, Fusco-Almeida AM, Mendes-Giannini MJ. In vitro characterization of Trichophyton rubrum and T. Mentagrophytes biofilms. Biofouling 2014;30:719-27.
van der Linden JW, Camps SM, Kampinga GA, Arends JP, Debets-Ossenkopp YJ, Haas PJ, et al. Aspergillosis due to voriconazole highly resistant Aspergillus fumigatus and recovery of genetically related resistant isolates from domiciles. Clin Infect Dis 2013;57:513-20. Antifungal Susceptibility Testing: Current role from the clinical laboratory perspective Brunella Posteraro, Riccardo Torelli, Elena De Carolis, Patrizia Posteraro and Maurizio Sanguinetti. Mediterr J Hematol Infect Dis 2014;6:e2014030. CLSI. Reference Method for Broth Dilution Antifungal Susceptibility Testing of Yeasts. Approved Standard-CLSI Document M27-A3. 3rd ed. Wayne, PA: Clinical and Laboratory Standards Institute; 2008. CLSI. Reference Method for Broth Dilution Antifungal Susceptibility Testing of Filamentous Fungi. Approved Standard CLSI Document M38-A2. Wayne, PA: Clinical and Laboratory Standards Institute; 2008. CLSI. Method for Antifungal Disk Diffusion Susceptibility Testing of Filamentous fungi. Approved Guideline. CLSI Document M51-P. Wayne, PA: Clinical and Laboratory Standards Institute; 2010. NCCLS. Reference Method for Antifungal Disk Diffusion Susceptibility Testing of Yeasts. Approved Guideline. NCCLS Document M44-A. Wayne, PA: National Committee for Clinical Laboratory Standards; 2004. Fothergill AW. Antifungal susceptibility testing: Clinical laboratory and standards institute (CLSI) methods. In: Hall GS, editor. Interactions of Yeasts, Moulds, and Antifungal Agents: How to Detect Resistance. New York: Springer; 2012. p. 65-74. CLSI/NCCLS. Reference Method for Broth Dilution Antifungal Susceptibility Testing of Conidial Forming Filamentous Fungi. Approved Standard NCCLS M38-A. Wayne, PA: National Committee for Clinical Laboratory Standards; 2002. Indira G. In vitro antifungal susceptibility testing of 5 antifungal agents against dermatophytic species by CLSI (M38-A) micro dilution method. Clin Microbiol 2014;3:145. Favre B, Hofbauer B, Hildering KS, Ryder NS. Comparison of in vitro activities of 17 antifungal drugs against a panel of 20 dermatophytes by using a microdilution assay. J Clin Microbiol 2003;41:4817-9. Jessup CJ, Warner J, Isham N, Hasan I, Ghannoum MA. Antifungal susceptibility testing of dermatophytes: Establishing a medium for inducing conidial growth and evaluation of susceptibility of clinical isolates. J Clin Microbiol 2000;38:341-4. Adimi P, Hashemi SJ, Mahmoudi M, Mirhendi H, Shidfar MR, Emmami M, et al. In vitro activity of 10 antifungal agents against 320 dermatophyte strains using microdilution method in Tehran. Iran J Pharm Res 2013;12:537-45. Koga H, Nanjoh Y, Makimura K, Tsuboi R. In vitro antifungal activities of luliconazole, a new topical imidazole. Med Mycol 2009;47:640-7. Rex JH, Pfaller MA. Has antifungal susceptibility testing come of age? Clin Infect Dis 2002;35:982-9. Rezabek GH, Friedman AD. Superficial fungal infections of the skin. Diagnosis and current treatment recommendations. Drugs 1992;43:674-82. Clinard VB, Smith JD. Cutaneous fungal infections. US Pharm 2015;40:35-9. Seebacher C, Bouchara JP, Mignon B. Updates on the epidemiology of dermatophyte infections. Mycopathologia 2008;166:335-52. Kim D, Lockey R. Dermatology for the allergist. World Allergy Organ J 2010;3:202-15. Rotta I, Otuki MF, Sanches AC, Correr CJ. Efficacy of topical antifungal drugs in different dermatomycoses: A systematic review with meta-analysis. Rev Assoc Med Bras (1992) 2012;58:308-18. Piérard GE, Piérard-Franchimont C, Arrese JE. The boosted oral antifungal treatment for onychomycosis beyond the regular itraconazole pulse dosing regimen. Dermatology 2000;200:185-7. Singal A, Khanna D. Onychomycosis: Diagnosis and management. Indian J Dermatol Venereol Leprol 2011;77:659-72. Kontoyiannis DP, Lewis RE. Toward more effective antifungal therapy: The prospects of combination therapy. Br J Haematol 2004;126:165-75. Carrillo-Muñoz AJ, Finquelievich J, Tur-Tur C, Eraso E, Jauregizar N, Quindós G, et al. Combination antifungal therapy: A strategy for the management of invasive fungal infections. Rev Esp Quimioter 2014;27:141-58. Gupta AK, Lynde CW, Konnikov N. Single-blind, randomized, prospective study of sequential itraconazole and terbinafine pulse compared with terbinafine pulse for the treatment of toenail onychomycosis. J Am Acad Dermatol 2001;44:485-91. Groll AH, Piscitelli SC, Walsh TJ. Clinical pharmacology of systemic antifungal agents: A comprehensive review of agents in clinical use, current investigational compounds, and putative targets for antifungal drug development. Adv Pharmacol 1998;44:343-500. Marchetti O, Moreillon P, Glauser MP, Bille J, Sanglard D. Potent synergism of the combination of fluconazole and cyclosporine in Candida albicans. Antimicrob Agents Chemother 2000;44:2373-81. Onyewu C, Eads E, Schell WA, Perfect JR, Ullmann Y, Kaufman G, et al. Targeting the calcineurin pathway enhances ergosterol biosynthesis inhibitors against Trichophyton mentagrophytes in vitro and in a human skin infection model. Antimicrob Agents Chemother 2007;51:3743-6. Nyilasi I, Kocsubé S, Krizsán K, Galgóczy L, Papp T, Pesti M, et al. Susceptibility of clinically important dermatophytes against statins and different statin-antifungal combinations. Med Mycol 2014;52:140-8. Farmaki E, Roilides E. Immunotherapy in patients with systemic mycoses: A promising adjunct. BioDrugs 2001;15:207-14. Casadevall A, Pirofski LA. Adjunctive immune therapy for fungal infections. Clin Infect Dis 2001;33:1048-56. Bhatta AK, Keyal U, Huang X, Zhao JJ. Fractional carbon-dioxide (CO2) laser-assisted topical therapy for the treatment of onychomycosis. J Am Acad Dermatol 2016;74:916-23. Cross SA, Scott LJ. Micafungin: A review of its use in adults for the treatment of invasive and oesophageal candidiasis, and as prophylaxis against Candida infections. Drugs 2008;68:2225-55. Miceli MH, Kauffman CA. Isavuconazole: A New broad-spectrum triazole antifungal agent. Clin Infect Dis 2015;61:1558-65. Cruz MC, Goldstein AL, Blankenship J, Del Poeta M, Perfect JR, McCusker JH, et al. Rapamycin and less immunosuppressive analogs are toxic to Candida albicans and Cryptococcus neoformans via FKBP12-dependent inhibition of TOR. Antimicrob Agents Chemother 2001;45:3162-70. Butts A, Krysan DJ. Antifungal drug discovery: Something old and something new. PLoS Pathog 2012;8:e1002870. Sharma M, Manoharlal R, Shukla S, Puri N, Prasad T, Ambudkar SV, et al. Curcumin modulates efflux mediated by yeast ABC multidrug transporters and is synergistic with antifungals. Antimicrob Agents Chemother 2009;53:3256-65. Ferreira-Nozawa MS, Silveira HC, Ono CJ, Fachin AL, Rossi A, Martinez-Rossi NM. The pH signaling transcription factor PacC mediates the growth of Trichophyton rubrum on human nail in vitro. Med Mycol 2006;44:641-5. Odds FC. Genomics, molecular targets and the discovery of antifungal drugs. Rev Iberoam Micol 2005;22:229-37.